Tomorrow, Leeds United take on Arsenal in the 3rd Round of the FA Cup. They’re probably going to lose. Badly. And the Arsenal fans I talk to on Twitter will have a field day. But I’ll have the last laugh. Because there are some things you pick up as a Leeds United fan. Amongst the angst, the heartbreak and the freezing cold Tuesday night defeats are a few important things. Things that you won’t pick up at Old Trafford or Stamford Bridge. Because there are some things that only Leeds United can teach you about writing. I won’t lie. There are some things that being a Leeds fan (or indeed a football fan of any stripe) can’t teach you. It can’t teach you how to pronounce words like Eng-ur-land properly. It can’t teach you how to use grammar, no matter how well the boys done there. And it can’t teach you to go ninety minutes without swearing long and loud at some percieved slight by player, referee or fellow fan. But it can teach you some very important lessons that will stand you in good stead as a writer. For three years, I spent my Saturdays either in a three-quarters full Elland Road or traipsing to glamorous locations like Port Vale, Stockport and Kettering. Such was the life of a Leeds fan in the third division. But we stuck at it, and eventually found ourselves moving in the right direction. Upwards. As a writer, you’ll need that perseverance to see out the bad times. There will be points when you’re lacking in creativity, when the phone just isn’t ringing, or when you’ve spent so long staring at a blank sheet of A4 paper that you’re certain you’re going mad. And the trick is to ride them out. By persevering, sticking at it and keeping the faith, you’ll eventually find yourself moving in the right direction again. The only thing worse than the lean times following Leeds are the good times. Dominate the top flight in the 70’s, spend the 80’s in division two. Win the league in 1992, don’t win away from home in 1993. Get to the semi-finals of the Champions League in 2001, lose a third division playoff final in 2008. When Leeds try to rest on their laurels, success seems to serve only as a warning flag for bad times on the horizon. As a writer, you need to learn to keep moving forward. Your last piece might have been world class, but if you spend too long basking in the adulation and the plaudits, you might find yourself slipping backwards very quickly. It’s all well and good saying you’re as good as your last work, but you really need to concentrate on your next piece. For three years, Leeds rubbed shoulders with footballing giants like Yeovil, Plymouth and Huddersfield Town. Teams that hadn’t accomplished anything in living memory, and didn’t look likely to achieve anything in the near future. And, during that time, who did Leeds fans class as their biggest rivals? Manchester United. English and European champions during Leeds’ sojourn in the third division. It might sound like delusions of grandeur, but it’s an important lesson. You should always judge yourself against the very best in the field. If you’re not comparing your writing to the work of great writers, you won’t be able to judge how best to improve your style and technique. It’s all well and good saying you’re better than an outsourced Indian content writer with English as a third language, but by comparing yourself to him, you’re setting your sights very low. Ok. As a writer, you won’t need to kick people. And with the exception of Max Gradel, very few Leeds players spend much time kicking people anymore. But if there are two character traits that Leeds fans demand of their players, it’s grit and determination. Flair, charisma and even (to a point) natural talent all take a back seat to sheer bloody-mindedness. And you need to have those character traits to succeed. Because if you can’t dig deep, grit your teeth and show some determination, you’re just waiting to be overtaken by someone who can. So if you want to be the best, you need to work hard for it. And if not, you’ll only have yourself to blame. So. There you go. A writer’s life lessons learned from watching Leeds United. How to suffer through the bad, not become over-confident through the good, and how grit and determination can help you go toe to toe with your supposed betters. And all without diving on the floor, clutching your girly face and screaming blue murder and spittle at a terrified ref. But if you think those particular skills can somehow help you write better copy, you don’t need to leave your armchair. 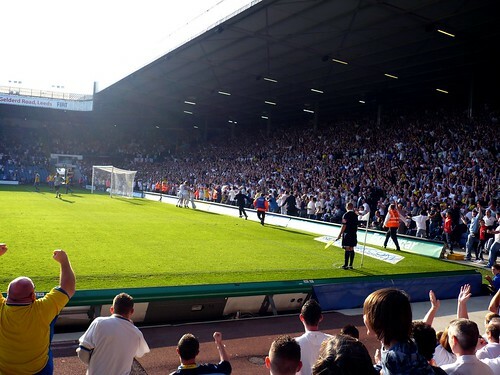 3 Comments comments for "What Being a Leeds United Fan Can Teach You About Writing"
You Left Out Terminal Pessimism, You’ll do em at your elland road now and I for one will be cheering on leeds! Not sure I want us to win. I can’t stand Huddersfield. It’s all too late now – the hard work for nothing, lucky Arsenal.